Strawberry shortcake has been in my head lately for two reasons: 1. Oregon strawberries are at their peak right now and 2. 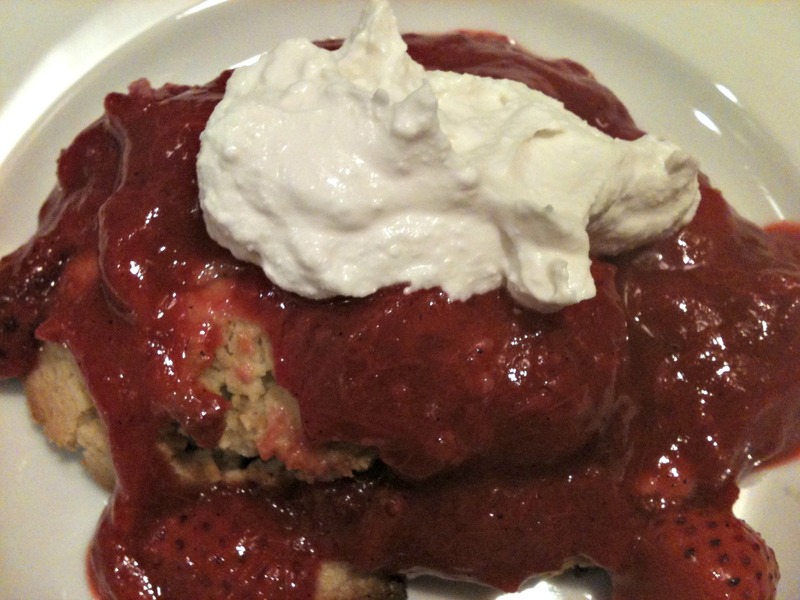 I recently made a batch of paleo biscuits that I knew would serve as killer shortcake. Another seasonal item has been on my mind too: rhubarb. Often, rhubarb season comes and goes before I make the time to grab some and create something delicious with it. This time, I picked some up at the Alberta Co-op, before it was too late. Rhubarb and strawberry go together like peas n’ carrots, so I thought why not add some rhubarb to the shortcake party? I do not recall ever seeing rhubarb strawberry shortcake — I’ve only ever seen the two combined in pies or fruit pizza (something my mom made from time-to-time). I ran with the idea and made a rhubarb strawberry compote and served it on top of paleo biscuits with coconut milk whipped cream. The combination of everything is literally a match made in heaven! Add rhubarb, honey, lemon juice, cardamom and sea salt to a saucepan and cook over medium heat for 5 – 7 minutes, or until rhubarb starts to soften. Cut a slit lengthwise down the vanilla bean pod. Carefully run a knife over the pod, scraping out the seeds. Add to saucepan, along with the pod. 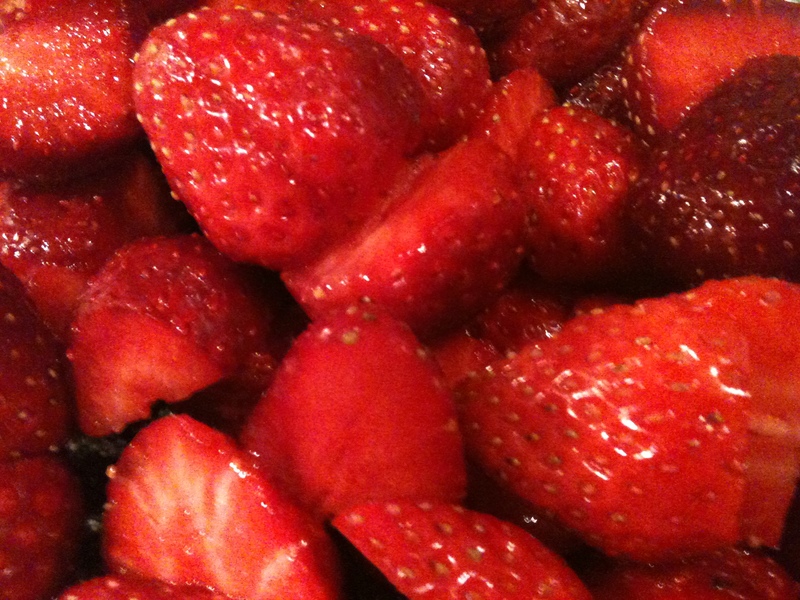 Add strawberries to the saucepan and stir. Let cook for about 5 minutes more, until the strawberries have broken down a bit. Remove from heat and let pan cool in an ice bath or in a sink filled with cold water. Discard the vanilla bean pod. Taste the compote and add more lemon juice or honey if necessary. Place coconut milk in the fridge and chill overnight. Do not shake can before putting in fridge. Meanwhile, place a small bowl (stainless steel works well) in freezer to chill. Remove coconut milk from fridge and open. You will notice the coconut milk solids concentrated at the top. Scoop the solids into the chilled bowl, being careful not to scoop any of the water from beneath. Save the water for another recipe, smoothies, etc. With hand mixer or whisk, beat coconut milk solids together with vanilla and honey. Boom, whipped cream! Click HERE for the biscuit recipe. To serve, cut a biscuit in half and spoon compote over top. Top it off with a dollop or two (or four, five…whatever!) of whipped cream. Dive in and try not to freak out because of how amazing it tastes! Oh my goodness! I am so going to try this!! Yay, let me know how you like it! Great…devoured by 4 teenagers in 5 minutes.